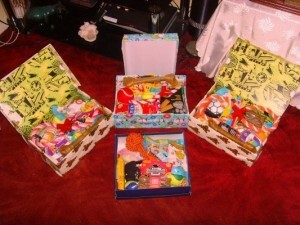 When Holly died she was on a very large amount of medications for her many ailments. 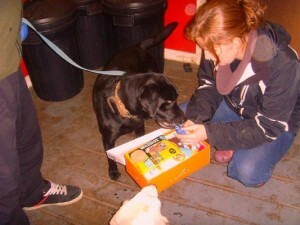 After she passed away, her remaining meds couldn’t be returned but amounted to hundreds of pounds worth of veterinary supplies. 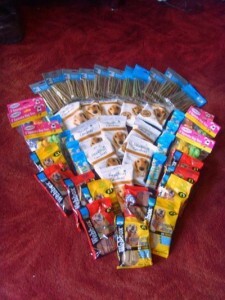 They were donated to various shelters and sanctuaries for dogs and other animals with similar ailments to the ones Holly had. 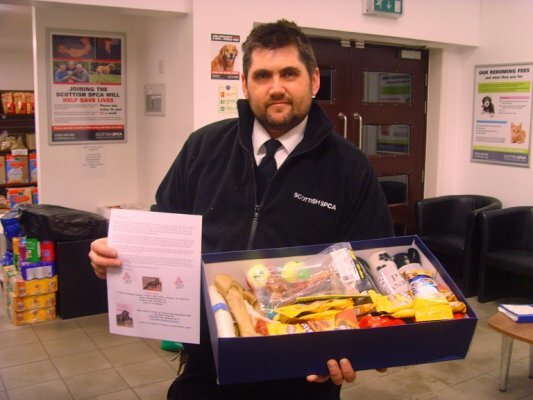 Working closely with Parcels4Troops we agreed that the next five goody boxes would be sent to the Military Police Dogs, again working with U.K. forces in Afghanistan. 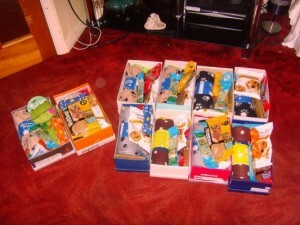 Many thanks to Pets at Home, Fergusons Pet Store (Tranent) and Tesco in Haddington for contributing to these boxes. 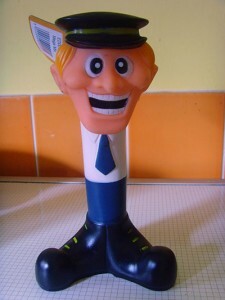 We particularly loved the squeaky policemen toys! 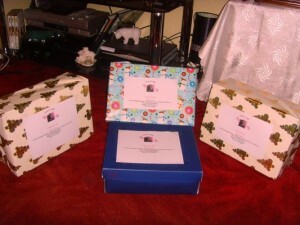 Thank you also to Cobblers of Melrose for providing us with the empty shoe boxes. 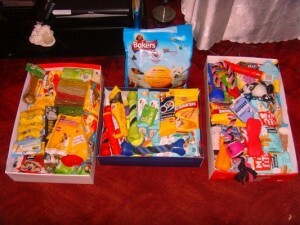 All the treats, toys and blankets that will fill the goody boxes for LRRSS’s ten elderly and special needs long term foster dogs. 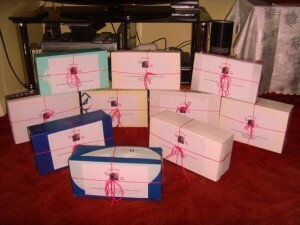 All the boxes packed up and ready to go. 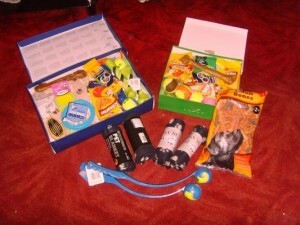 Two of the dogs had skin problems so they had slightly less treats but extra toys. 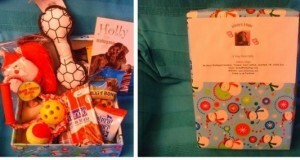 A special box was made up for a little blind chocolate Lab with extra smelly treats and a squeaky toy as she relies more on her sense of smell and hearing. 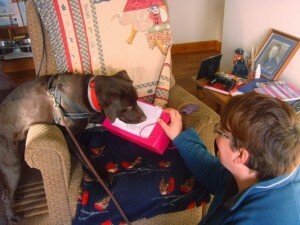 Sweet Tilly, the blind chocolate labrador getting stuck into her goody box! 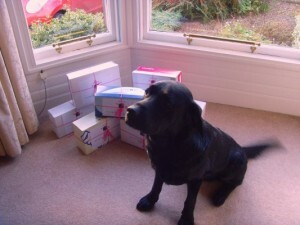 tail is wagging madly at the thought of being the boss! 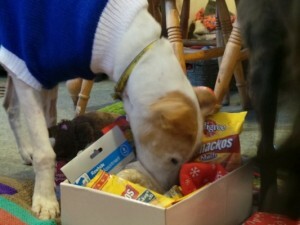 Sweet Rupert enjoying his goody box – he can’t get into the treats quickly enough! Another Hug delivered! 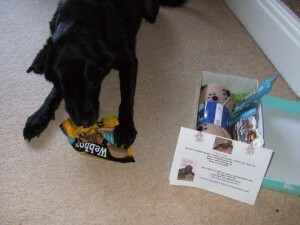 This is Islay enjoying her goody box from Holly’s Hugs. 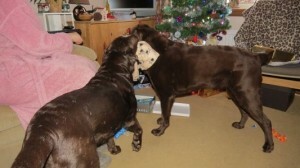 Islay is an LRRSS foster dog that has health problems which mean she cannot be re-homed. 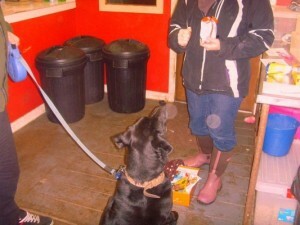 Since being under the wing of LRRSS she has had the surgery and medication that she needed and she will be staying with her foster family. 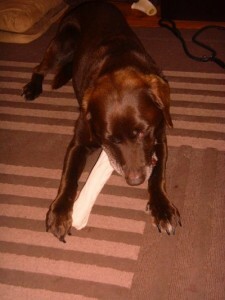 She is a very gentle, loving little girlie who is being well loved and spoilt. 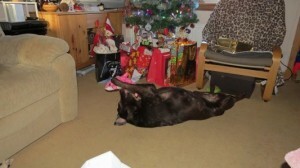 She enjoys her country walks and a snooze in front of the fire. 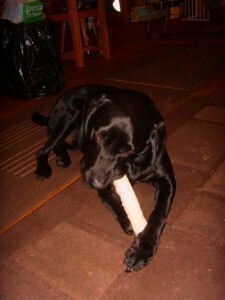 Islay is using very skilful paws to get into her treats! 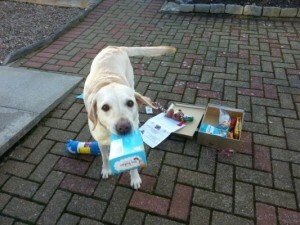 Another Hug delivered to Gunner, a LRRSS dog – he couldn’t wait to get stuck into his goody box! 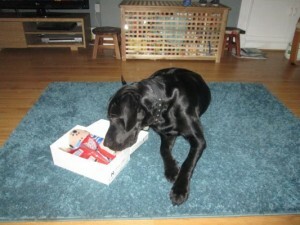 Gunner getting stuck into his goody box! 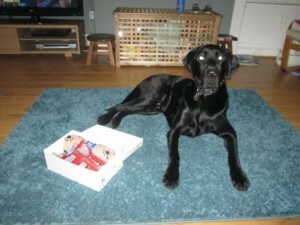 And more to Benson, another LRRSS dog. 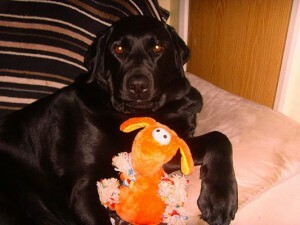 He was very patient while his photos were taken! 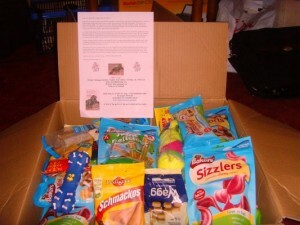 Another big box of goodies sent to the doggy soldiers at Camp Bastion as a Christmas Hug from Holly. 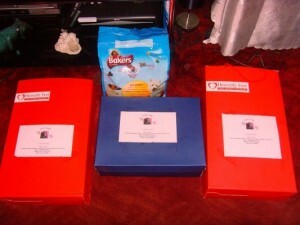 Boxes all packed and ready to go to Coupans Kennels, Dunblane and Any Dog’ll Do in Edinburgh. 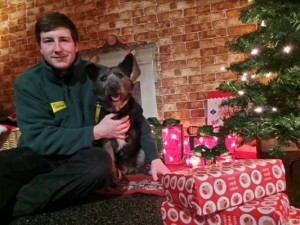 In December 2013, Holly’s Hugs donated £50 to Dogs Trust Oakfield Oldies so they could buy some lovely treats and toys for their elderly dogs as a Christmas Hug from Holly. 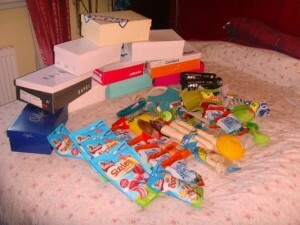 Here they all are enjoying their gifts! 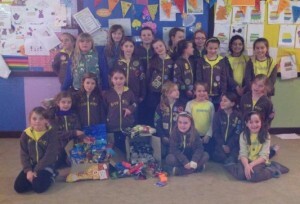 A huge thank you to 1st Tain Brownies who collected lots of goodies, treats and toys for us to fill Holly’s Hugs boxes. 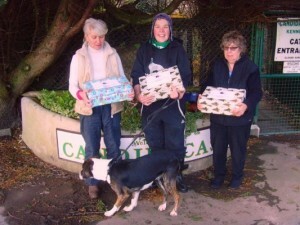 They are pictured below alongside a Hug from Holly delivered to the SSPCA in Balerno, Edinburgh. Below are the staff of Lothian Dogs Home, Midlothian, accepting goody boxes alongside a Holly’s Hugs volunteer. 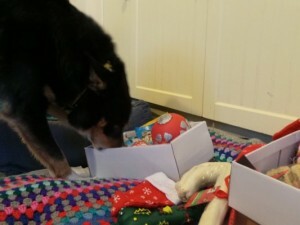 In December 2013 we had hoped very much to be able to deliver a Hug from Holly to a very special dog called Ty who was very ill. 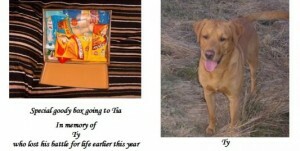 Sadly, Ty passed away before we could get his box to him but his owners very kindly asked if his box could be donated to another special needs dog from LRRSS called Tia. 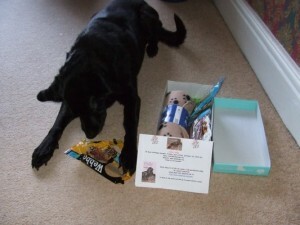 Tia loved her box and we all send a big thank you to Ty and his mum and dad for their kindness at a time of such sadness for them. 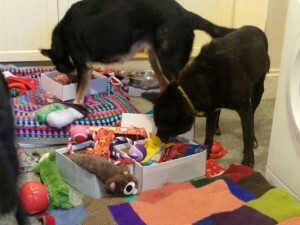 And below we have another two LRRSS dogs loving their goody boxes and sharing the blankets and toys on Christmas Day! 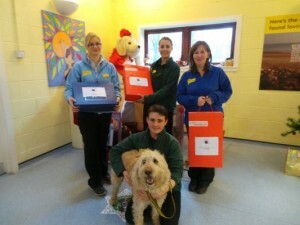 In December 2013 we packed up a load of goody boxes to deliver more Hugs from Holly, this time to Dogs Trust at West Calder. 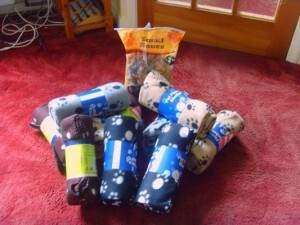 They were gratefully accepted by the staff with the help of Ollie the Labradoodle. 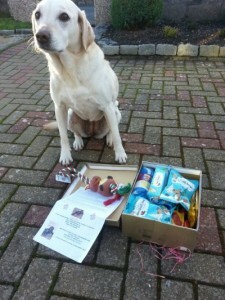 Our first Hug from Holly for 2014 was delivered in February to Edinburgh Dog & Cat Home in Seafield. 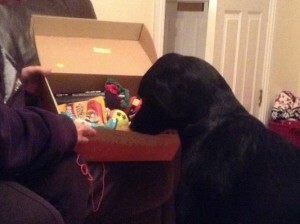 Here it is being accepted by Nonnie and Ziggy.